Laptops and mini PCs powered by the new generation of Intel Gemini Lake processors are coming soon, but companies are still launching Apollo Lake based products with various features. MeLE PCG35 Apo mini PC is one of them, and what makes it interesting compared to most of the competition is support for 80mm M.2 SSDs and 2.5″ SATA drives, on top of featuring a Celeron J3455 processor, one of the most powerful of the family. I took photos of the mini PC, accessories, and internal design in the first part of the review, so I’ll report about my experience with Windows 10 Home, explain how to manage the different drives, and test stability under load. 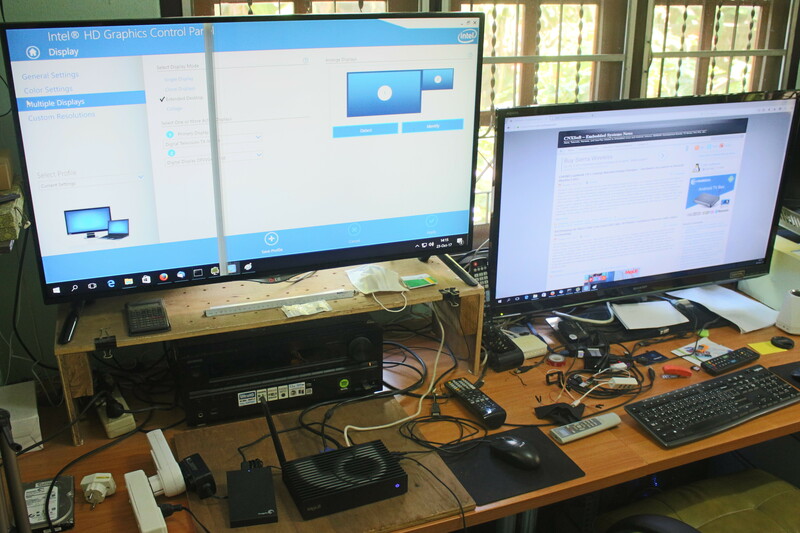 Last time, I’ve showed how to install an M.2 SSD and 2.5″ SATA hard drive inside MeLE PCG35 Apo, so I just have to connect a few cables (HDMI, VGA, Ethernet, Power) and USB peripherals with USB keyboard, USB mouse, and USB hard drive. When we connect the power the power button should be red, and we can press it to start the device, the power LED changes to blue, and within a few seconds we’ll be greeted by the setup wizard asking us to select the language. With MINIX NEO Z83-4 Pro, I had Cortana assisting me through the process, but it did not happen here, so it must be a Windows 10 Pro only feature (TBC). C: is the eMMC flash with Windows 10, D: is the M.2 SSD, and E: and F: are respectively the NTFS and exFAT partition of the USB drive. I had to format D: to be able to use it, but my SATA HDD was nowhere to be seen. I’ve using the drive for Windows and Linux reviews, which explains why Windows did not show it. So I started Disk Management. Sure enough, I could see all the 4 drives with Disk 0 being my SATA drive. I deleted and create the partition for Disk 0 again, assigned letter G: to it, and formatted it with NTFS within Disk Management program. G: – SATA HDD – Data like documents, photos, videos, large downloads, etc… that do not really benefit from fast random I/Os. 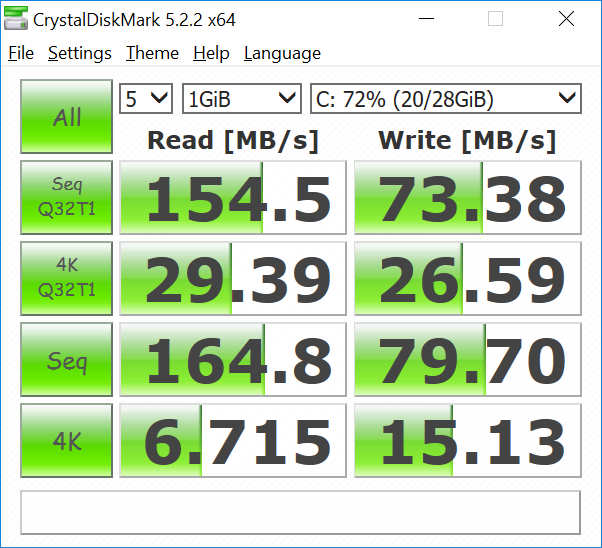 As we’ll see below, the M.2 SSD are much better performance compare to the eMMC flash, so you’d possibly gain a little bit performance by moving Windows 10 to the SSD, and use the eMMC flash for something else. The only problem is that it does not comply with Microsoft’s discounted Windows 10 license, which prohibits installation media larger than 32GB, so Windows would not be activated if you move it to another drive. Linuxium managed to move Windows 10 from the eMMC to SSD and keep it activated on Beelink AP34, but the instructions are a little complicated, and there’s guarantee it will work overtime, as Microsoft may change the way it detects the activation. 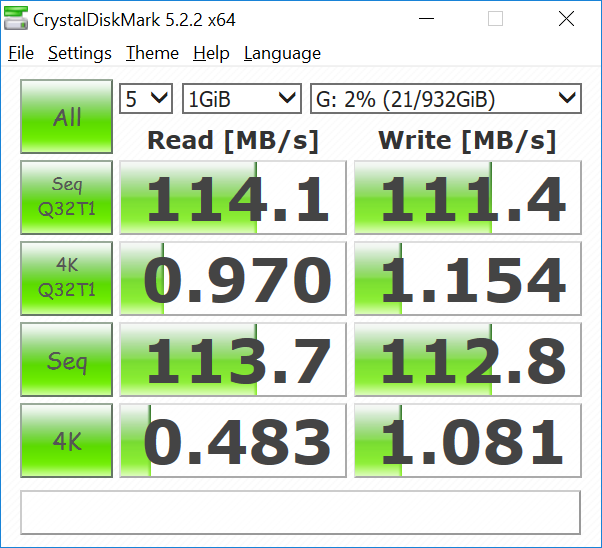 So I’d recommend to keep Windows 10 on the eMMC flash, and if you need more space for program and/or better performance, add an M.2 SSD. Now Windows will still try to install program to the C: drive by default. You can usually change that while installing programs, but it’s easy to forget, so it’s better to change the default to D:, or whatever the drive letter for your SSD. 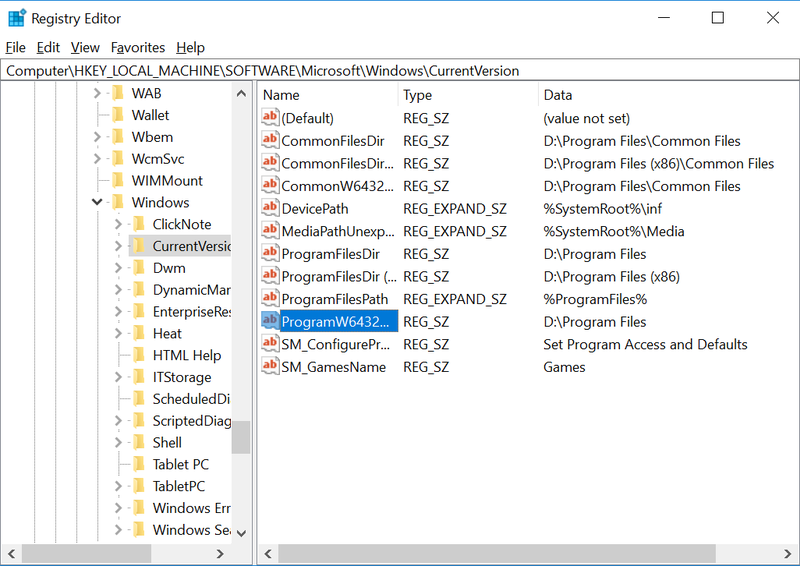 Launch Regedit, and go to HKEY_LOCAL_MACHINE\SOFTWARE\Microsoft\Windows\CurrentVersion to change all default paths to D:. You may also consider moving your email client and browser(s)’ profiles to the SSD drive both to save space on the eMMC flash, and gain better performance. I have not done it for the review. 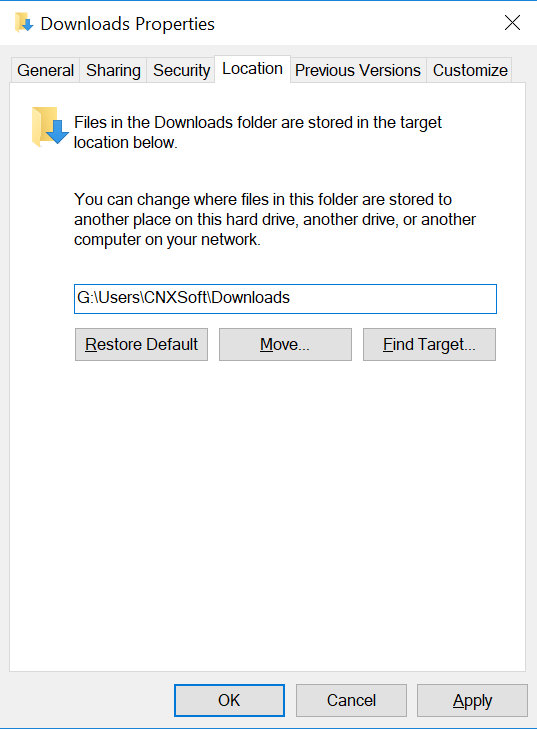 Then I right clicked on Documents, Photos, Videos, Music, and Downloads folder in the File Explorer, selected Properties->Location, and change C: to G: in order to make sure all files are stored on my hard drive as shown below for the Downloads directory. I did not have to remove any programs during this review, but at the end, I only had just under 4GB free space on the eMMC flash (C:). 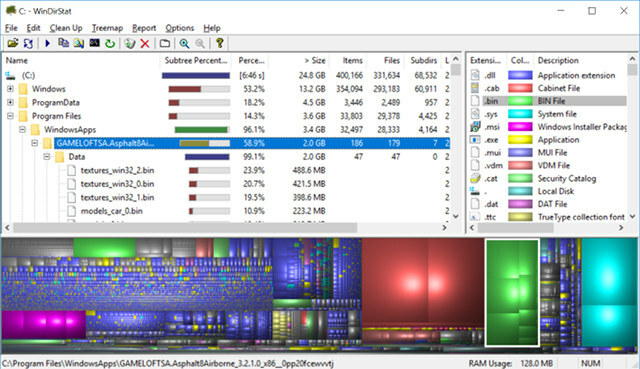 WinDirStat can help you find out what takes space. For example, the screenshot below shows applications installed from Windows Store – such as Asphalt 8: Airborne – are found in the C drive. So you may want to move that directory, as I have already explained in MeLE PCG03 Apo review. 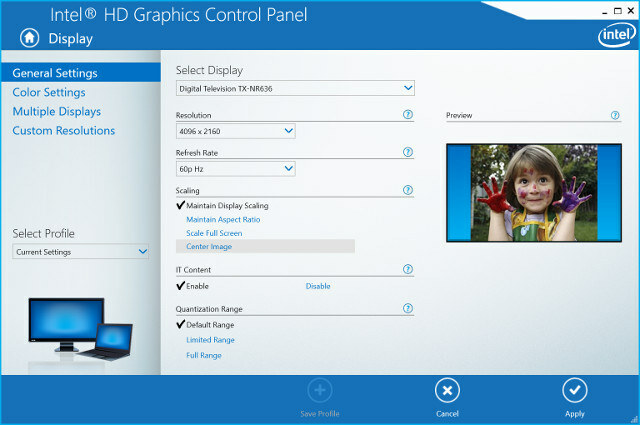 Most people will probably just use an HDMI display with 1920×1080 resolution, but the mini PC also supports 3840×2160 or 4096×2160 resolution @ up to 60 Hz. 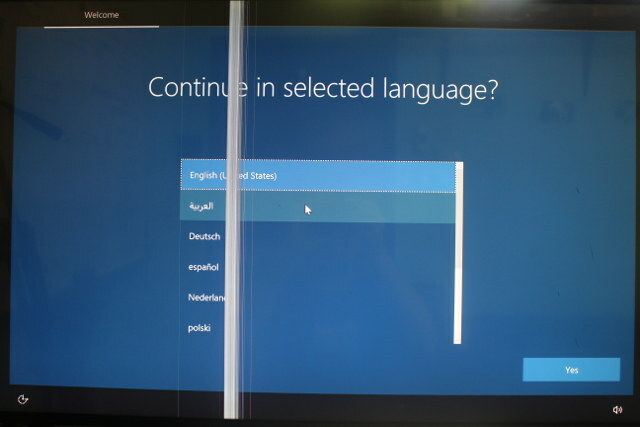 Windows 10 Home will however show a message about “optimal resolution” being 1920×1080 when you do so. 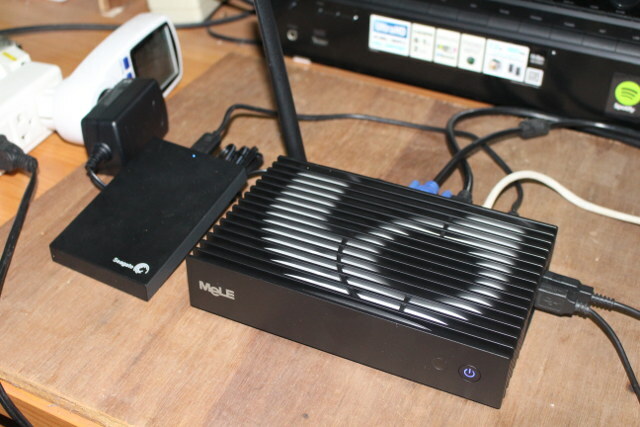 As with most other MeLE mini PC, PCG35 Apo also comes with an extra VGA port which allows for dual display setup, and I had no troubles using it. The mini PC is also equipped with a USB type C port, but note that it is only for data (like another USB 3.0 port), and can not be used as a DisplayPort output, nor for fast charging. Going to Control Panel > System and Security > System shows the mini PC is indeed powered by an Intel Celeron J3455 processor @ 1.50 GHz with 4 GB RAM, and runs an activated version of Windows 10 Home 64-bit. I’ve also taken a screenshot of Device Manager for people waiting more technical details. 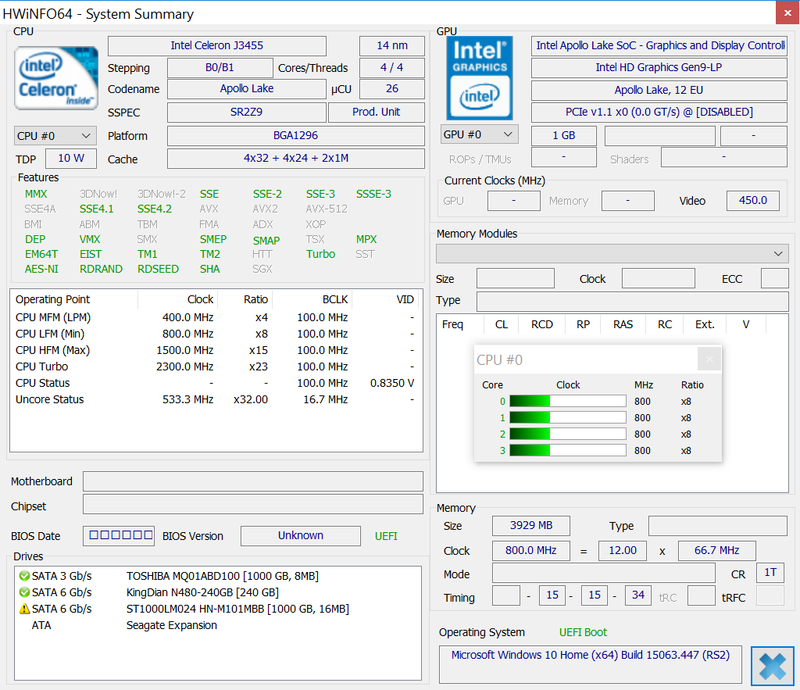 HWiNFO64 gives some more details about Celeron J3455, and unsurprisingly it has the same features as Celeron N3450, but the base frequencies (CPU HFM (Max)) and turbo frequencies are different. The memory clock (800 MHz) is lower than on MeLE PCG03 Apo (933.33 MHz = 14 x 66.7 MHz). As we’ve just seen above, and confirmed on Intel website, Celeron N3450 and J3455 are basically the same SoC, but later has higher base and turbo clocks for both CPU and GPU, resulting in a higher 10W TDP. So in theory, we should expect PCG35 Apo (J3455) to be very slightly faster than PCG03 Apo (N3450). I’ve started benchmarking with PCMARK 10 and 8. MeLE PCG35 Apo achieved respectively 1,391 and 1,724 points for both, which compares to 1,334 and 1,767 points on PCG03 Apo. So both platforms actually perform about the same on those two benchmarks. Passmark PerformanceTest 9.0 shows quite a different story with PCG35 Apo only getting 790.7 points against against 995.7 for PCG03 Apo. If we look at the detailed CPU Mark is higher, Disk Mark similar, Memory Mark a little lower, but most of the points are lost because of 2D graphics mark, and especially 3D graphics mark (163 vs 335.9). Very odd. 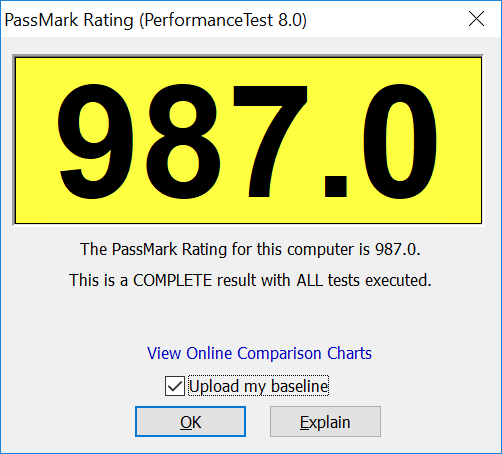 I’ve also run Passmark 8 to compare with older results. 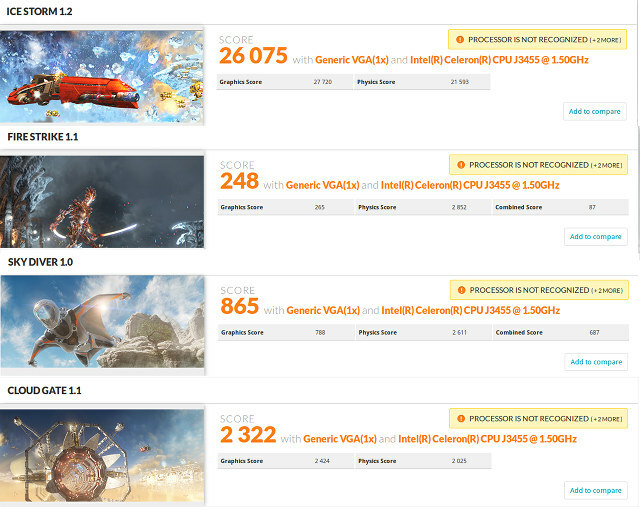 However, 3DMark results are much closer, with on average PCG35 Apo performing very slightly better. 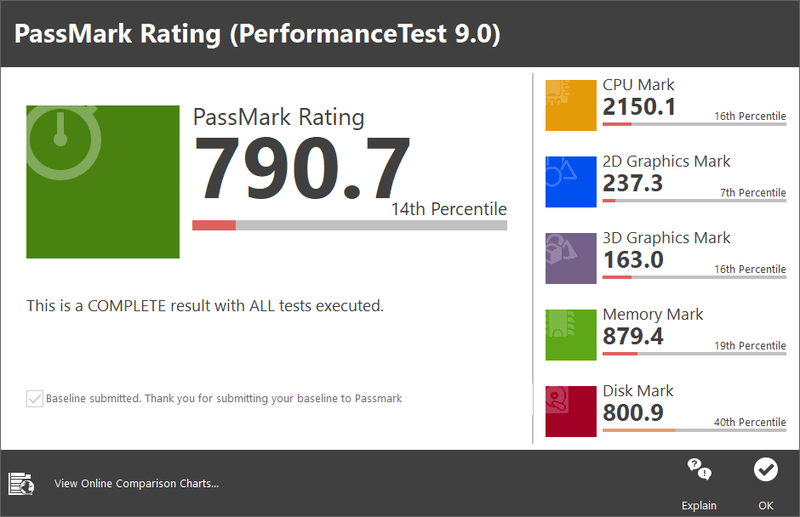 For most results above, I doubt the user would notice any differences, except possibly for 3D graphics in Passmark 9.0 (I repeated the test twice to make sure). 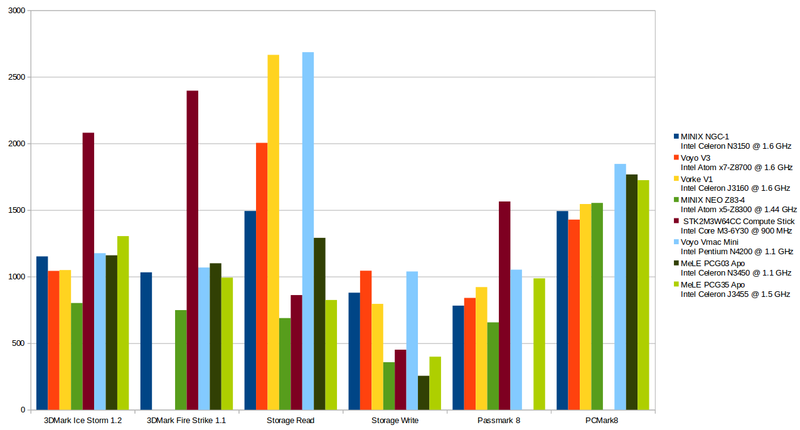 Switching to storage performance with CrystalDiskMark 5.2.2 x64. The 32GB eMMC flash performs as expected with 164 MB/s sequential reads, and ~80 MB/s sequential writes, and average random I/O. KingDian N480 SSD attached to the M.2 slot is much faster both for sequential R/W and random I/Os, and the results are about the same as during the SSD review. 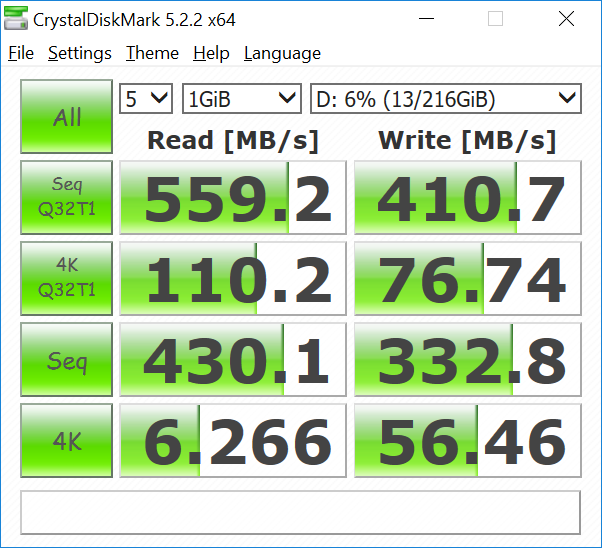 I also tested the SATA hard drive, and again the results are as expect with around 110 MB/s sequential R/W speeds, and very poor random I/O due to slow seek time on mechanical drives. 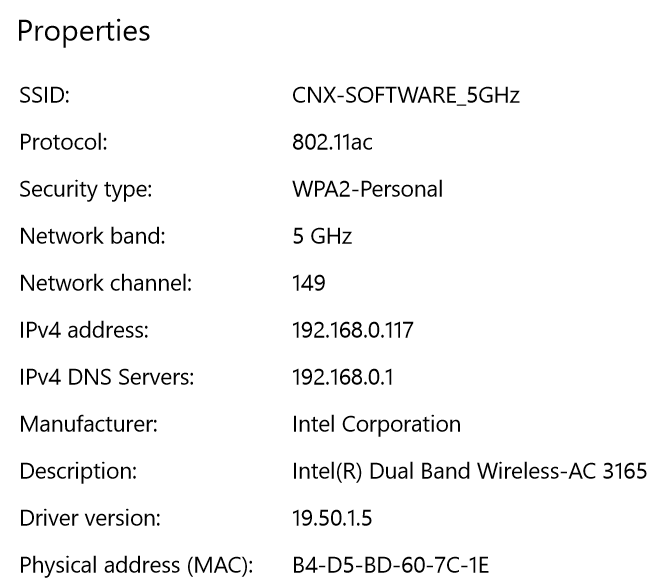 I had no troubles to connect to WiFi 802.11ac. Upload was similar to download speed in MeLE PCG35 APo (~250 to 275 Mbps). I repeated upload tests at three different times, but they were all around 55 to 57 Mbps. 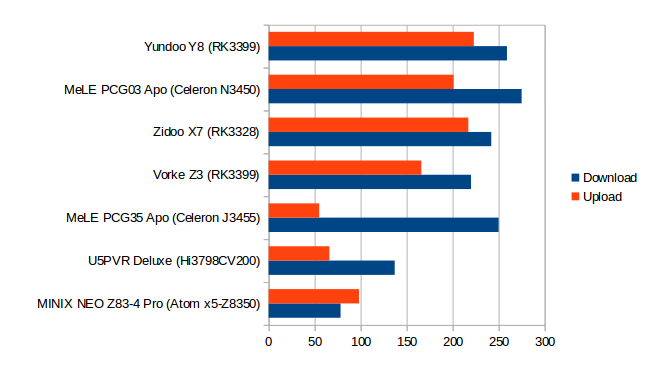 I’ve pitted MeLE PCG35 Apo against other low power mini PCs in the chart below, including systems based on Braswell (MINIX NGC-1, Vorke V1), Cherry Trail (Voyo V3, MINIX NEO Z83-4), Apollo Lake (Voyo V1 VMac Mini, MeLE PCG03 Apo), and Skylake (Compute Stick) for various benchmarks. Note: The scores have been adjusted for easier reading on single chart., e.g. Ice Storm scores divided by 20, Fire Strike scores multiplies by 4 for scale, etc..
Automatic frame rate switching is also working well with the resolution changed to 3840×2160 when playing video, and the refresh rate matching the one of the framerate video. VP9 is using software decode, and does not play well. So I enabled audio pass-through in Kodi by going to Settings->System Settings->Audio, switching to Advanced mode, enabling Allow passthrough, and selecting WASAPI: HDMI TX-NR636 (Intel Display Audio)…. as the Passthrough output device. You should then get a list fof HD audio codecs to enable / disable, and I switched them all on: AC3, E-AC3, DTS, TrueHD, and DTS-HD since those are supported by Onkyo TX-NR636 receiver. Same results, and disappointment, as with MeLE PCG03 Apo, the eDP 1.2 to HDMI 2.0 chip might get in the way with audio pass-through, as Apollo Lake HDMI 1.4 usually support AC3 and DTS at least. It’s hard to see much differences between all those Apollo Lake platform, but in this case 4K Youtube videos were unwatchable in Firefox, even after disabling VP9 with h264ify extension. 4K VP9 YouTube video played fine in Microsoft Edge with no frames dropped (as per stats for nerd). However, I could head audio cuts every few minutes. I also used HWiNFO64 in sensor only mode, and thermal throttling was never reported by the program…, so MeLE PCG03 Apo is a solid device with good thermal design. You can watch Voyo VMac V1 video if you’ve never an Apollo Lake mini PC in action. 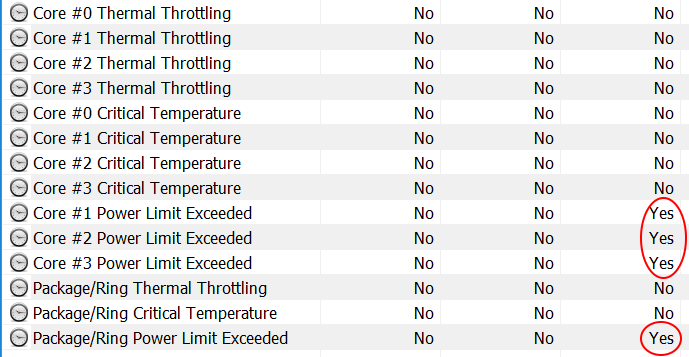 After that I tested system stability with AIDA64 Extreme, and for a little over 30 minutes, everything went fine, but then I noticed a sudden drop in temperature, but no CPU throttling detected. 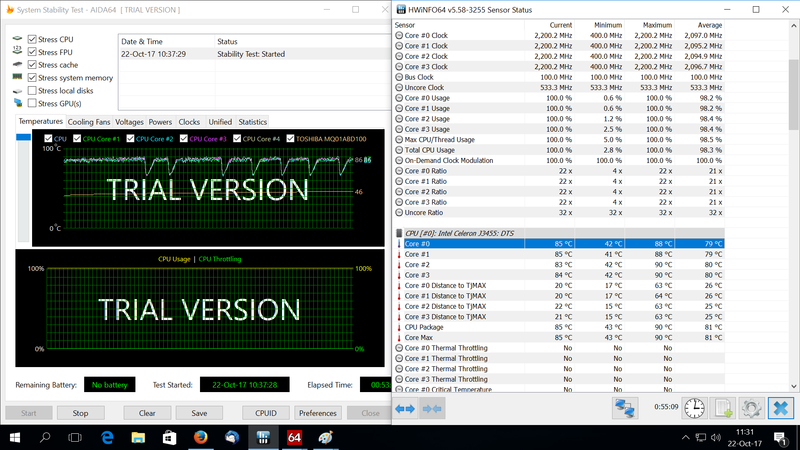 I waited a bit longer, and surely enough it happened again, and I could see the CPU frequency drop as low as 400 MHz before creeping back up to 2.2 GHz within a few seconds. As you can see from the red highlight, still not thermal throttling… But if we scroll down just bit we can see “Power Limit Exceeded” for Core #1, #2, and #3, as well as as “Package/Ring Power Limit Exceeded”. So somehow the power used by the chip must have gone over 10W, and it automatically reduced the frequency. If we continue with the stress test up to the hour, we can see waves in the temperature chart every few minutes, and each time frequency drops to around 400 MHz, then up to 900 MHz, etc… and up to 2.2 GHz. So performance is not perfectly constant. This must also be related to temperature, as during the first 30 minutes, CPU temperature was lower, and I did not see any sudden drops in temperature. That means the mini PC does not run at full capacity all the time when under load. I rebooted the computer, and ran HWiNFO64 while using the computer for web browsing, playing videos, and checking email, and the same power limit were exceeded too. My room temperature is close to 30°C, and you experience may differ at 20 or 25°C, as it should take longer for the problem to occur, if ever. If you’d expected MeLE PCG35 Apo to perform better than MeLE PCG03 Apo you’ll be disappointed. Benchmarks are similar, but cooling? did not work as well with the system CPU frequency dropping from time to time due to “exceeded power limit”. Cooling is more tricky on that model due to the 10W Celeron J3455 SoC, and the fact that I tested it with both M.2 SSD and SATA HDD installed inside the device. However, HWiNFO64 never detected any over heating, but only “over powering”. Maybe there’s a BIOS option for that but I did not investigate yet. My room temperature is close to 30°C, so it may have impacted the results too. Other features are very similar to PCG03 Apo with dual display support (HDMI 2.0 + VGA), 4K 60 Hz video output and playback, and so on. However I found some issues with 3D graphics in PerformanceTest 9.0 benchmark, and WiFi upload speed is quite slower than PCG03 (although most people will only care about download). I’ll try Ubuntu 17.10 installed to the M.2 SSD in a few days. The main selling point of MeLE PCG35 Apo is support for internal 2.5″ hard drive, and if you don’t do anything too demanding you could purchase the mini PC for $179.99 shipped on Aliexpress (Wait for the week-end if the price is higher when you check it out). If you don’t care about the internal SATA bay, MeLE PCG03 Apo going for $159.20 including shipping is probably a better option. 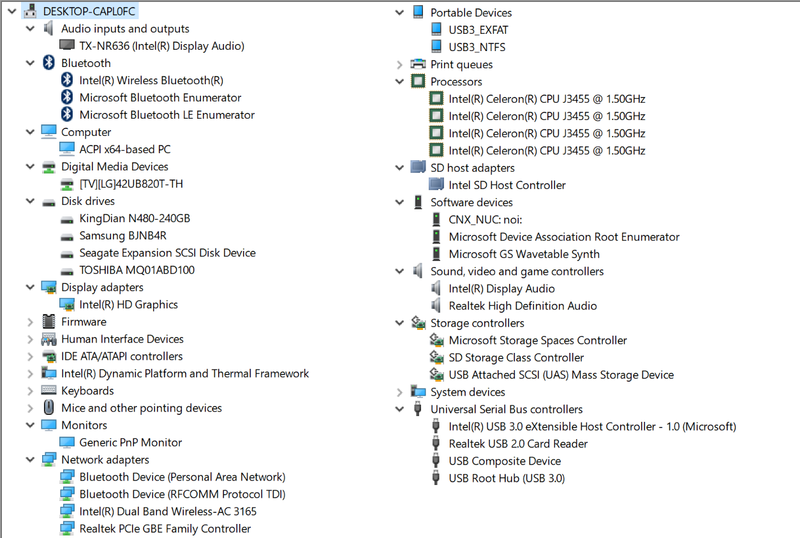 Question can you partion emmc memory to appear as two separate drives to the system, if yes would windows 10 be fooled? I don’t see the benefit of partitioning the eMMC flash, it would the system almost unusable. Or do you mean as an experiment with a very small partition to see if Windows becomes unactivated? 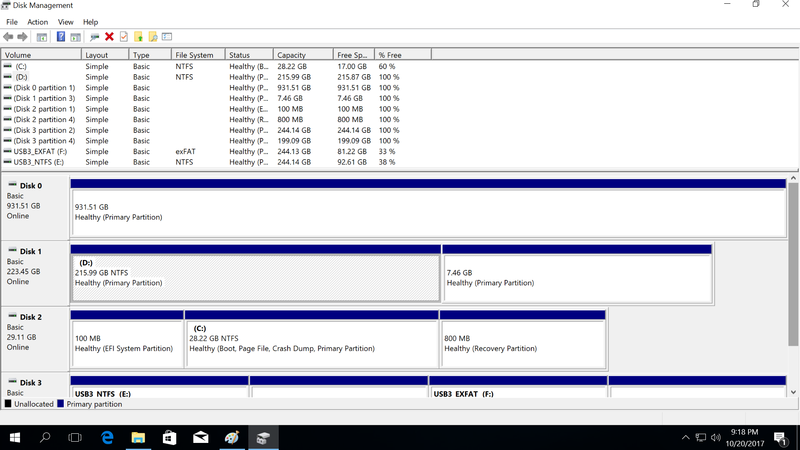 More of a interest in can you use a bigger storage medium, drive but get around Microsoft’s discounted Windows 10 license, which prohibits installation on media larger than 32GB, by partitioning a bigger drive to appear to the system as two different, partitions, drives. 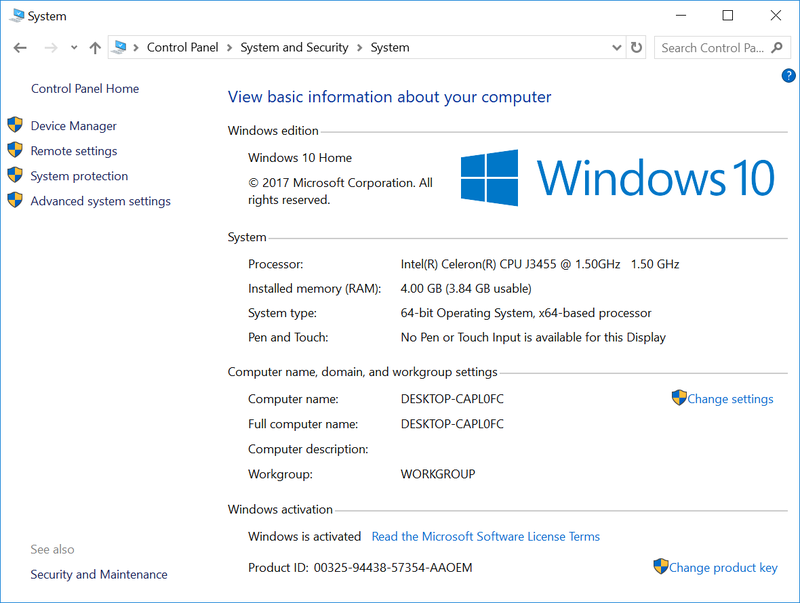 Enabling you to fool Windows 10 discount license 32GB limit? OK, then you mean partitioning the SSD then. It might be possible, but not necessary, as you could instead use Linuxium method. I is also possible to buy cheap Wn7 license and upgrade it for free to full Win10 without such limitations. Windows 7 would not install on such a system with a recent processor. I’m also not sure the free Win7 to Win10 update is still available. I understand Microsoft stopped that a while ago. The overheating issue occur because the heatsink has poor contact with the CPU chip. I have the vorke v1 plus with a similar CPU. After following the instruction of another forumer to sand down the heatsink stand so that the heatsink is in direct contact with the cpu chip and replace the thermal pad with thermal grease, I ran AiDa64 at 30 deg Celsius ambient temperature and it never go above 65 degrees. As the fan kick in only at 70 degree so its likr to like comparison.i am sure the mele 35 heatsink is comparable or better than the smaller vorke heatsink.